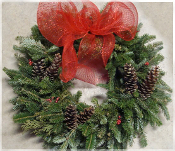 We are taking orders for our fresh holiday wreaths, swags, crosses and kissing balls which are handmade on our farm from an assortment of evergreens that are grown in Central Wisconsin (fraser fir, balsam, cedar and white pine) and decorated with pine cones and berries. We offer a variety of hand tied bows. If you would like to discuss the bow or large orders, please give us a call at 920-229-0225. We will also ship your orders to family and friends and include a card and message, please note this in your comments. Happy Holidays!